After visiting Dave Wanninger's garden I picked up my fellow botanophile, Boerner Botanic Garden hortie Jessica Cloninger, for a trip to Rotary Botanic Garden. I finally got to meet Rotary's director of horticulture, Mark Dwyer, in person and he gave us a brief tour. If you haven't been to rotary, I highly suggest a visit; and if you haven't read Mark's blog, you should check it out! This year's color theme in the front gardens was pink. Overall it was bright and vibrant. While I didn't get a picture, I feel like the obelisks could have been a different color. They just seemed to blend in too much for my taste. Otherwise the gardens looked great. Over the last several years I've grown to really appreciate supertunias. And recently 'Vista Bubblegum' has emerged as one of the best. Here it's paired with a sweet potato that really impressed us, sweet caroline 'Bewitched'. As always the formal gardens were full of great looking annuals. The boxwoods looked like they took a little bit of a beating this winter, but they are definitely recovering nicely. It was nice to see this mas planting of autumn crocus, Colchicum. I really need to get some of these in my own gardens. I initially thought this narrow little maple was an upright sugar maple, but it turns out it's a columnar Norway maple. Another maple in the garden I'm quite fond of is 'Nizetti' sycamore maple. The variegation on the leaves is quite striking and brightens up a shady garden. I'm really very fond of sedges and it's always nice finding new ones. 'Grasshopper' has been added to the list of must haves. Carex morrowii has generally been a good performer for me, and 2 more varieties will probably get added to my gardens at some point after seeing them at Rotary. 'Silk Tassel' and 'Silver Sceptre' are both fine-leaved forms. Along with sedges, I'm also a fan of Japanese forest grass, and I think 'All Gold' is one of the best ones on the market. This rock wall is amazing and I think one of the best uses of it. 'Stripe it Rich' is another great forest grass that came on the market a few years ago but has remained fairly hard to find. The gold and white foliage is quite nice! A grass that I hadn't seen for quite some time is Calamagrostis 'Cheju Do'. This is a great hybrid feather reed grass with a dwarf habit that is really versatile. It deserves much wider use. I'm a huge fan of white wood aster, Eurybia divaricatus, and it was mass planted here in the shade. If you aren't growing this (I prefer the compact form called 'Eastern Star') in your shade garden, you're really missing out on a gem. Another aster I really liked in the garden is Symphyotrichum (aster) shortii. This is a native woodland aster and is tolerant of dry shade. I will have to try this one here. Spotted some Digiplexis. If you aren't yet familiar with this new annual (for us, perennial in z8-10) garden plant, it's a cool inter-generic hybrid between Digitalis purpurea and Isoplexis canariensis. It appears to be a good bloomer. Hopefully I can pick a few up to try out next year. I'm a big fan of all of the various Araliaceae members and am always happy to find them in gardens. First we spotted the gold form of Aralia cordata, a great variety called 'Sun King'. I've had this in the garden for a few years now and it's growing nicely and is giving me a flower stalk this year. A short while later we came across the species looking pretty fabulous with its fruit clusters. I really should have grabbed a handful to grow. As a species, A. cordata gets quite large and tropical looking. The gold forms reportedly stay smaller; I would love an imposing 9' tall specimen of the species in the garden! There was a nice display of plants that were once grown by Thomas Jefferson at Monticello. For those not aware, Jefferson was a true plant geek; he grew a vast array of ornamental and edible plants from all over the world. Rudbeckia 'Sahara' is a new variety that I'm not at all familiar with. It's a seed strain and the description states: "warm, subtle tones in amber, blushing copper, and soft burnt rose" and the picture shows much bolder colors than what I saw. These didn't fit that description, but were very pretty; nicer than the single marketing pic I can find. Most were double to some extent, I prefer the ones with fewer petals in the first picture here. Not gonna' lie, I love doug fir. Probably going to need this one some day. We came across the cut-leaf forsythia and while we were pretty sure it was a forsythia neither of us had seen this type before. It apparently gets to be a beast, up to 12' tall. Those leaves make me want to do some hybridizing w/ some short forms to get better fall color and dwarf habit to go along w/ those leaves! We got to see some of the Cannova series Cannas; these are cannas grown from seed and I'm pretty impressed. Jess and I both really love the giant garden with all of the great tropicals in it. The theme is "Where the Wild Things Are". Pictures don't do this garden justice, it really needs to be experienced. We both really like the windows and working doors as well. I liked the combo baskets w/ wandering jew, begonia, and fuchsia. Wandering jew is an old fashioned plant and maybe not real popular any more; this showed that it can still be a great plant for use as an annual in combos. I like the bonfire begonia w/ boston fern for the same reasons and may possible try that combo in the future. Spotted a nice clump of Vernonia 'Iron Butterfly'. This plant had not performed well for me in the garden or in pots; nice to see it can do well in gardens around here. Two great hardy fountain grasses that I saw last year and made it through the rough winter. I picked both up that week directly from Brent Horvath at Intrinsic Perennial Gardens. 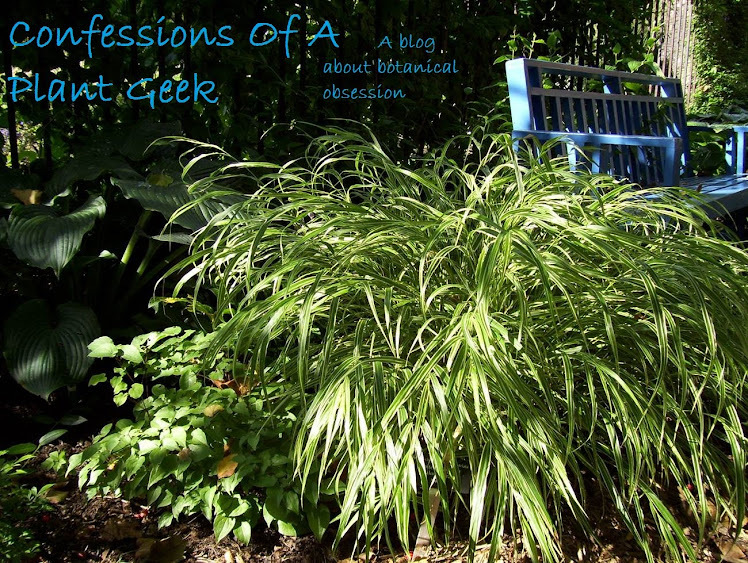 I love fountain grasses, but so many don't make it through the winters here. These two are standouts in the crowd. I got to see the Bounce series impatiens up close. They are reminiscent of the sunpatiens series. Nice plants but I wouldn't use them as a replacement for New Guinea or walleriana impatiens. They are resistant to Impatiens Downy Mildew, which is a great thing. Allium cyaneum, a cute diminutive onion with blue flowers; Salvia pachyscapa to replace the one I bought last year that made it through the winter only to die in the wet spring; Corydalis cheilanthifolia; Tricyrtis 'Kohaku', a hybrid between T. macranthopsis and T. hirta that has the same arching habit of macranthopsis with creamy yellowish flowers with purple spots similar to hirta; and Tricyrtis hirta 'Variegata'.